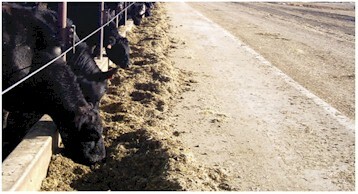 Using cost share funds - The Livestock Pollution Prevention Program (LP3) offer two options for cost share assistance - full containment systems and partial containment systems. 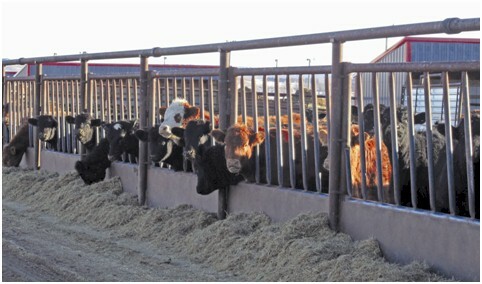 The full containment option is geared toward beef feedlots, and dairy, hog and larger cow/calf operations. 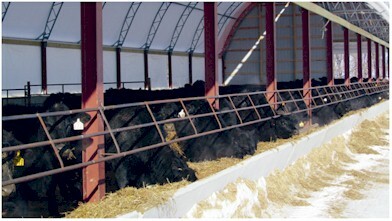 The partial containment option addresses most cow/calf operations. Cost share can cover up to 60 percent of eligible expenses. 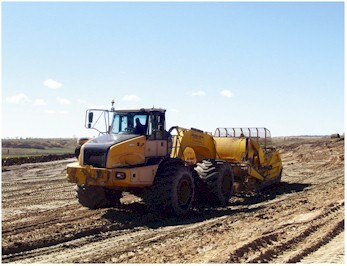 Producers who choose the full containment option are eligible for up to $175,000 cost share for excavation, ponds, lots, diversions, heavy use pads, fencing, waters, access roads and windbreaks. 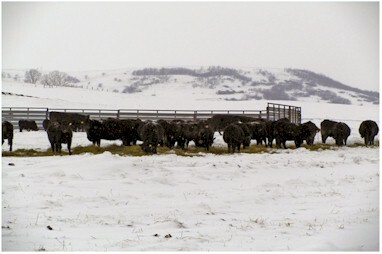 Producers choosing partial containment are eligible for up to $25,000 cost share for clean water diversions and/or winter grazing systems which include portable windbreads, such as that pictured below, and waterline/waterers. 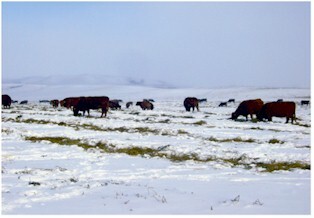 Winter grazing systems decrease manure accumulations near surface water. 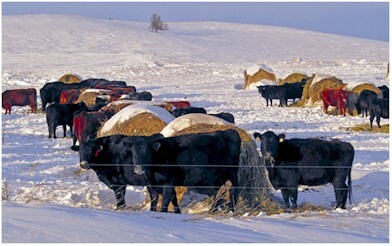 Many producers using these systems feed cattle on cropland and practice aftermath, swath or bale grazing. The producer contacts the program coordinator and schedules an on-site visit. The program coordinator evaluates the site and provides environmental management recommendations to the producer. If management or structural changes are needed, the coordinator and producer discuss cost share options. The coordinator helps the producer develop cost share contracts and secure contracting and engineering services. 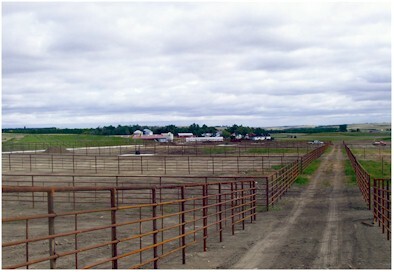 1) Lots are sloped to industry standards and provide ample space for the cattle. 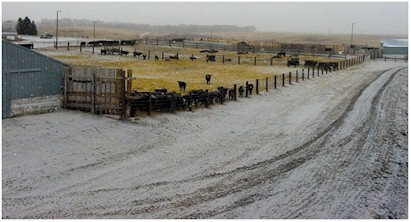 2) Fenceline Feeding System allows cattle to stay dry, healthy and provides increased gains, which can be cost shared through the LP3 Program. 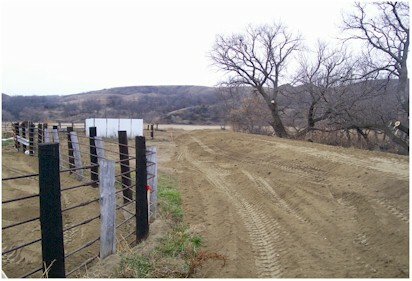 3) Access Road acts as a dike for the lots and is utilized for fenceline feeding. 4) Clean Water Diversion reduces runoff and sometimes is the only management practice needed in small operations. 5) Runoff Evaporation Pond collects dirty water running off lots and is designed to evaporate a large portion of the incoming water. 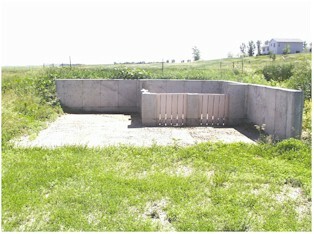 6) Solid Separator separates solids from lot run-off water and allows dirty water to run into the evaporation.